I can’t believe we are almost mid-November and that Christmas is coming up so fast. Before we know it, the festive lights in the city will turn on and the shops will be filled with people looking for the perfect gift for their loved ones. Me, I will be doing my shopping online, same as I did for the past few years. 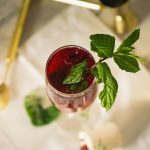 Today though I wanted to share with you a festive cocktail recipe that will probably accompany me whilst I am in front of my computer, doing online shopping. 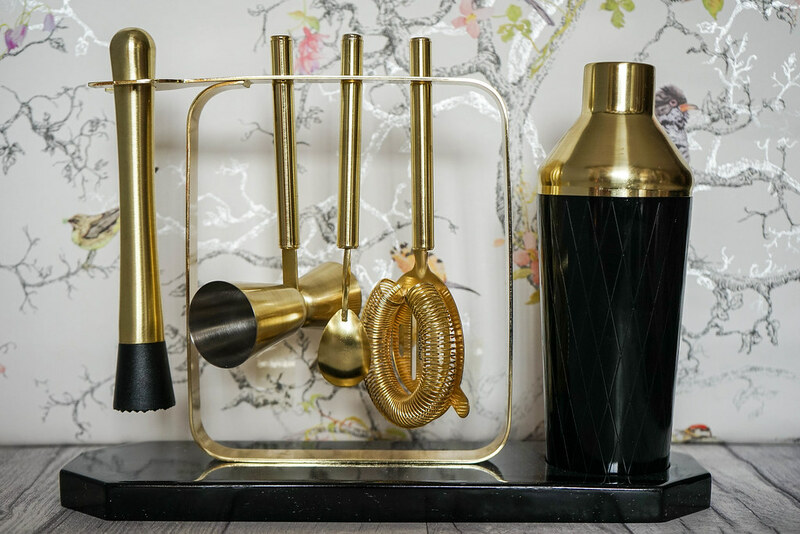 Domu has sent me this gorgeous 7 pieces VonShef Black Cocktail Set with stand that today I have put to use. After browsing Pinterest for a while for inspiration, I created this perfect festive cocktail that is not only infused with Christmassy flavours, but it also looks adorable. Add the mint and a bunch of the red berries into the cocktail shaker and muddle them together. Add the gin, the Vermouth, the red berries juice and the ice and shake vigorously. Strain the liquid into a cocktail glass and top up with soda water. Add a few whole berries and some mint in the glass, for decoration. Now the fun part: Rudolf! 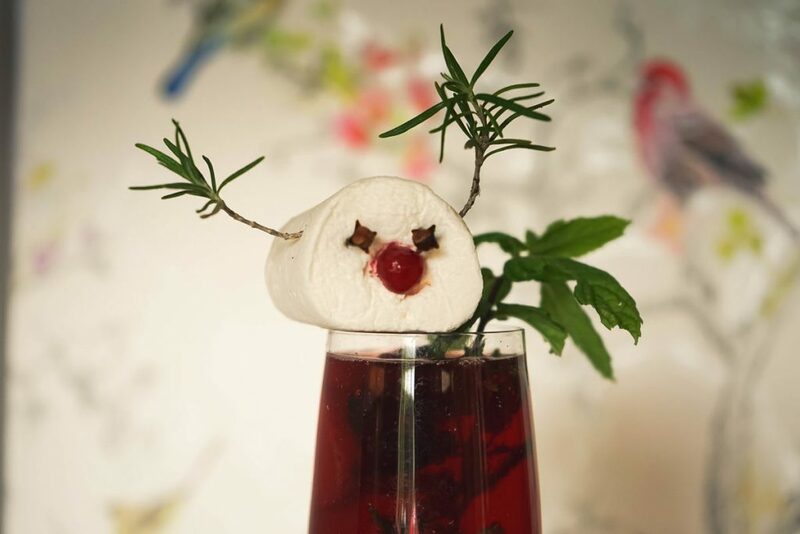 Push the two cloves into the marshmallow to create the eyes, and the two rosemary springs on top, to create the antlers. Then make a small hole with a knife in the middle and insert a cranberry, for the red nose. Add Rudolf on top of the glass, to impress your friends. Disclaimer: This article was written in collaboration with Domu who gifted me the cocktail set for the purposes of this post. However, all the opinions featured in this post are completely mine and have not been influenced by it. ← Gift your loved ones a foodie Christmas Hamper this year! I need to try this since I was pregnant last Christmas and slept all through it. This time I am actually able to have a nice glass or a couple of drinks and this can definitely be it. Now this 100% sounds like the perfect glass to have as a festive treat. I love how you have used rudolf as the main idea! The marshmellow adds a wonderful touch. This drink sounds so yummy. I really like the reindeer decoration. It is so cool and unique. I’ve just got to save this post and try it over the holidays. Oh my gosh, this is the best! I MUST make this during the holidays. I know some friends who would get a kick out of this drink. Perfect for Christmas party! I love the marshmallow decoration on top of Rudolf’s Red Berries Fizz! Everything gin and red berry juice makes so delicious! What a gorgeous idea! I am definitely going to try this at my Christmas party!! So fun. Now this looks equal parts cute and fancy. 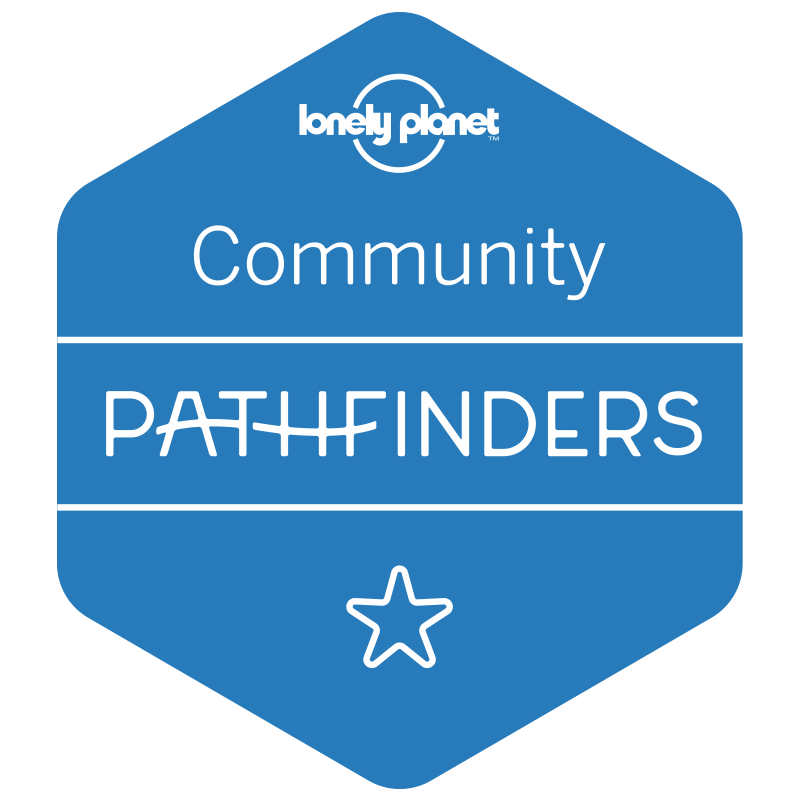 That’s an achievement you should be proud of, I’m really interested in brewing my own cocktails so I’ve got to give this a shot one day! as much as i love the drink itself i can’t help but notice the cute marsmallow snowman, lol! and yes a cocktail mixer like this is a must have especially the holiday fast approaching! Christmas eve plan is now sorted. I am going to try this for sure already bookmarked this article. 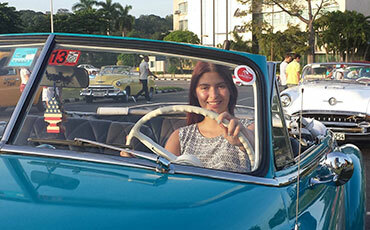 Love the decoration too if possible then will share pictures too. I need to try this amazing cocktail! I am gonna prepare this one on my own. I love a festive cocktail and this one sounds absolutely delicious…. Definitely going to try! I just love fizzy and fruity drinks! I’m saving this recipe for sure, and that cocktail set is beautiful! What a perfect holiday drink. Love that you will be drinking this while doing online shopping. I think that’s a great idea!!! might need to try this too. This is the perfect cocktail! The flavors sound great, and it looks like a Christmas ornament in a glass. I love it! I love easy to make cocktails that are tasty. But if they have complicated processes or include a lot of ingredients, I probably won’t make it at home. Oh wow, I love your little cocktail station. I would certainly give this Rudolf Red Berries Fizz a try this season. It’s a pretty perfect cocktail for the holidays. What a creative and great idea with the Rudolph marshmallow! The drink sounds delicious, making this tonight! A Christmas cocktail WITH MARSHMALLOWS that is so so awesome and it looks gorgeous! Thank you so so much for sharing. Great idea! I love festive cocktails! This looks so perfect for the holiday season, can’t wait to give it a try!! I am all about the fizz! I will have to make that garnish for one of my Christmas cocktails. What an inspiring post! I will toast you when I make one! I love the color of this drinks and it looks really delicious. I would love to try this for our Thanksgiving dinner. I love how you’ve decorated it! So cute but this cocktail sounds so good! Cheers! I’m not really a huge gin fan. But this looks very delicious and refreshing . I would love to try this out. PS – that reindeer marshmallow is genius! We do not have christmas here so for me this is a really new concept. However, the name sounds good to me and so does the recipe. So once I am back home I will definitely make this cocktail and then share its outcome with you. that cocktail set is so freaking gorgeous! it would be such an amazing gift to cocktail lovers to make at home..
Wow, this is so perfect on our Thanksgiving party. It looks really delicious and looks so easy to prepare. Aside from the cocktail itself sounding delicious, this whole drink is awesome because of the little reindeer decoration. I love it! Definitely going to try this out this holiday season. So fun, I love that cocktail set and the festive cocktail. I’m doing my shopping online as well, so much easier. This sounds so good! I can’t wait to try it out for my Christmas party. I’m gonna have to get that cocktail set too – it’s so cute! I love festive cocktails! This looks so perfect for the holiday season, I am going to have to try some of these! this is perfect for any holiday party! sending to a few friends for theirs now! I was first get attracted to the cute little Rudolf on top of the red drink! What a cute deco you have there by using the marshmallow. I am going to try this drink out and hope my guest will be surprised and enjoy this drink! I’m not too much of a drinker but I do indulge once in a while. This set would make the perfect gift for somebody who entertains all year long. I is really good looking and functional. That cocktail set is absolutely beautiful, what a lovely set to have in your home. I’ll definitely have to give this cocktail a try, it sounds delicious! Now that looks like a super festive cocktail to serve up to guests after a dinner party. Yum! The little garnish is so cute too. I really want to try this out. That cocktail looks so refreshing and perfect for the holidays season! I also loved your cocktail set! I’m sure your guests are going to love it! My friends would absolutely love these. This would disappear in no time at our house! This is my kind of a Holiday treat. Wow, I have never tried to make this and this looks really delicious and easy. I will try to make this for my friends, thanks for sharing! Ohhh this sounds absolubtly delish! And that marshmallow is the cutest! We have a lot of gatherings on this coming month and I think this one of the delicious drink that I am going to prepare for all the guest. OMG this looks so chic and sophisticated! I love holiday drinks like this! Yummy! That is a very elegant looking cocktail set. I don’t take alcohol but would still love this set for festive season mocktails. oh my, this is the cutest idea ever! I need to try, but I’m afraid my version won’t be as pretty as yours! I am all about the cocktails especially over the holidays! I love trying new ones too. I am definitely going to try this 🙂 Thanks for the recipe!! 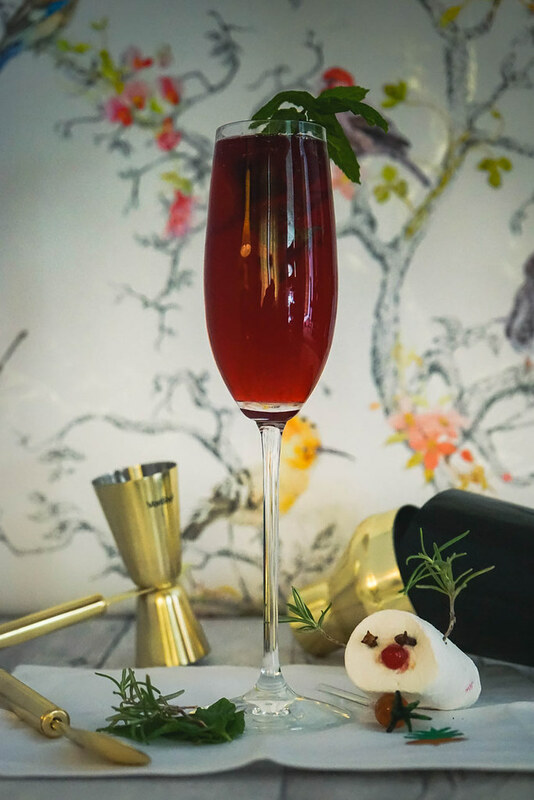 I love a good yummy coattail anytime, but holiday cocktails are always so festive and this one definitely seems like it won’t disappoint. Plus, you could even take these same ingredients and make a mocktail for the kids– a double win. What a yummy idea for a holiday cocktail! And I really love the fun name too. Definitely gonna try this one out! This drink is so cute looking, and it sounds like it tastes great, too! Will need to go buy some of the ingredients and try to make this winter. Very festive looking. Bright colours and whimsical, this would add cheer to the hand and the spirit.